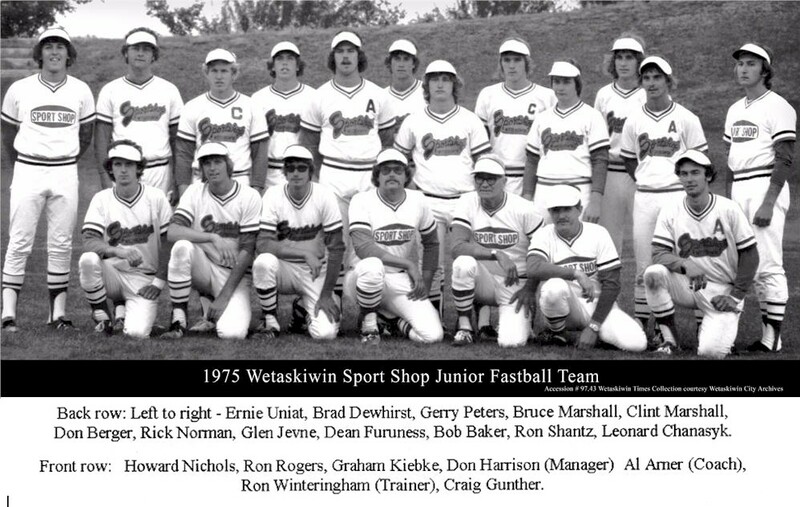 In 1975 the Wetaskiwin Sports Shop Junior Fastball team, coached by Al Arner and Don Harrison, won the Provincial Championships. They also represented Alberta at the Canadian Junior Fastball Championships where they narrowly lost the final game and were awarded the Silver Medal. Because of their achievements and the sportsmanship they displayed, the Sport Shop Juniors are being inducted into the Wetaskiwin and County Sports Hall of Fame. The nucleus of this team was first put together in 1969 when the players were at the Bantam level. They were coached by Terry Grimm and because there was no sponsor, team uniforms were blue jeans and white t-shirts. In their first year together this unassuming team of young players won the Provincial Championship. This feat was duplicated the following year at the Midget Level with coaches Pat Barry and Gerry Green. They were sponsored by the Sport Shop and looked sharp in their new uniforms. In their second year as Midgets, Al Arner furthered his involvement with the team and in addition to sponsoring them, he coached as well. Al had his own innovative ways to help the players improve their skills. The team started practicing in February in the Wetaskiwin Drill Hall. Batting practice consisted of trying to hit a ball on a string swung from a hockey stick. The pitching machine was a little less bizarre, however as Al added his own twist by poking holes into tennis balls to make them curve or drop. With dedicated practice this team had it all: good pitching, strong batting and fast base running. In 1973 they dominated the Men’s League so completely that to even things up Sport Shop pitchers would rotate through the men’s teams to help them out and make the league more competitive. Al remained as coach with this group through the Midget, Juvenile and Junior levels until 1975, leading them to Provincial Championships each year. In 1974 Al entered the now junior-aged team in the Senior Men’s Intermediate “A” Provincials. Despite their age and experience disadvantage, they still walked away with a Silver Medal. This led to the pinnacle of their success the next year (1975) when they vied for the title as the best Junior Fastball team in Canada. To advance to the Canadian Championships, the 1975 team was required to play in the Alberta Junior “A” Elimination Tournament. They went through the six team double elimination tournament undefeated and in the process of becoming Alberta’s representative, defeated the Beauvallun Aces, the 1974 Alberta representatives. The Canadian Championships were played in Saskatoon and a contingent of over 90 Wetaskiwin fans accompanied the team to cheer them on. Wetaskiwin was the only team to go through division play undefeated. In the double elimination playoffs, Wetaskiwin was defeated by Newfoundland but won over New Brunswick and Ontario, advancing them to the finals where they again played Newfoundland. The game was exciting and the teams were closely matched. 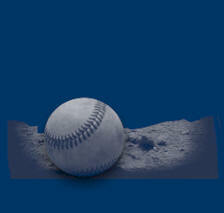 A seventh inning home run won the game for Newfoundland. The final score was 1-0 and according to a newspaper article, “It only went to show that the difference between the first and second place clubs was a gust of wind and a high fly ball.“ Three individual awards were given at the Championship and Wetaskiwin players were awarded two of them: top batter and top pitcher. 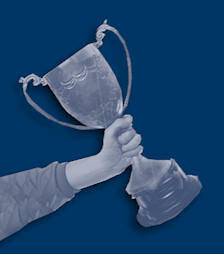 Two weeks after the Canadians, the Sport Shop Juniors went undefeated to capture the Alberta Provincial Championship. Five of the team members returned to play in 1976 and the Sport Shop Junior team, this year coached by Bruce Rogers and Gordon Berger, again won the Junior “A” Provincials and as well represented Alberta at the Junior Canadians in New Brunswick but failed to place. This was the last major achievement for this particular group of young men as the team disbanded before the next season. Over the years the group shifted slightly as some players left and new players came on to replace them. However, there was a core group that grew up and moved through the successive age divisions. After 1976 most of them were too old to play on a junior team so they moved on to play fastball for senior men’s teams across Alberta like the Wetaskiwin Car Capitals, the Camrose Merchants and other local teams. The exceptional successes of this team captured the interest of the people of Wetaskiwin, everyone was proud of the team’s accomplishments and team members were home town heroes. These were 19, 20 and 21 year old young men doing well at the Canadian level bringing honour and recognition to the community. Before the team was to leave for the Canadians, an exhibition “Donkey Baseball” game was held between the Sport Shop Juniors and the Wetaskiwin Media. The evening’s entertainment attracted 1000 spectators, a tribute in part to the city’s support for the Sport Shop squad. The 1975 Sport Shop Junior Fastball Team is more than worthy of being inducted into the Wetaskiwin and County Sports Hall of Fame. We applaud their achievements.